Forest officials at the Melghat tiger reserve (mtr) have a strange predicament: the management plan of this 1,676.93 square kilometre (sq km) reserve in Maharashtra's Amravati district cannot be executed, even though the state's chief wildlife warden gave it his assent way back in November 2003. The plan waxes eloquent about involving local tribals in managing mtr. B ut this falls flat in face of an affidavit filed by the Maharashtra government. In this 1995 undertaking, the state government assured the Nagpur high court (hc) that it will not allow any commercial exploitation of forests within the multiple-use area (mua) of the mtr. To understand that we will have to go back to 1994: till that year, mtr comprised a core (the Gugamal national park) and a buffer zone (the Melghat sanctuary). The core area was uninhabited, while there were 61 villages within the sanctuary. As per mtr's pre-1994 management plan, these villages with a population of 28,000 were to be relocated outside the sanctuary. 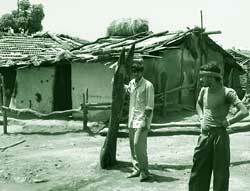 In 1994, the forest department (fd) realised that relocating so many people was unfeasible. "One had to be practical. There was no land and political will to relocate 61 villages. The challenge was to marry the interest of both the tiger and the tribal," says M G Gogate, ex-conservator of forests and field director, mtr. So, an enquiry was conducted and as per a notification dated February 15, 1994, 526.90 sq km of the sanctuary was re-classified as an mua (see map: Melghat today) . The area comprised 39 villages and the people here were to be given certain rights to collect non-timber forest produce (ntfp). The order, however, raised hackles of conservationist groups. In 1995, the Mumbai-based Bombay Environmental Action Group (beag) filed a public interest litigation (pil) in the Nagpur hc pleading that the move would destroy the mtr. In response, the Maharashtra government gave the hc an undertaking that it won't allow "commercial extraction of forest produce" in the mua. Trouble begins here The term "commercial extraction" has placed the mua in an ambiguous position, even before the court has delivered its verdict on the beag petition. Conservationists interpret the term as "status quo", while the fd believes it only implies a bar on activities such as bamboo harvesting. The department is, however, too cagey to implement its programmes for the mua. For example, in 2003, the fd came out with a working scheme for bamboo-bearing areas in the mua ( see box: Just on paper, and table: Scientific, but just on paper). Officials of the department estimate that Rs 2,000 crore can be raised anually -- and the money ploughed back into the mtr and for development of the 39 villages within the mua-- if bamboo is harvested scientifically in a three-year cycle. But the scheme cannot be implemented before the imbroglio over "commercial extraction" gets resolved. Note: Each area further divided into three coupes each. Meanwhile, people in the mua's 39 villages eke out a parlous existence by either extracting forest produce illegally or by bribing forest guards. An example aptly illustrates their predicament: a few logs fall naturally in the forests and villagers in the mua often collect them to construct houses or to sell in the market. Is that "commercial extraction"? The forest department is too caught up in legal complications to answer that unequivocally. As per the denotification order, the mua does not fall within the Melghat sanctuary and so people here do have rights over forest produce. But the fd's vacillation means that they cannot avail of these rights till the legal mess is set right. "We should file a fresh affidavit before the hc asking it to give local tribals permission to extract ntfp and bamboo in the mua," says Tanseem Ahmad, chief conservator of forests, Amravati. "Today, forest wealth worth thousands of crores gets decomposed within the mua, but none of it can be utilised by people in the 39 villages. What kind of conservation is this, which makes paupers out of tribals and does not help the forests either?" he charges. Ahmed has prepared a revised affidavit and forwarded it to the office of the principle chief conservator of forests-wildlife's (pccf-wl), Nagpur. But the file has not moved from the pccf-wl 's office. The matter came up at a recent public meeting organised by the Union government's tiger task force at Nagpur. The fd accepted its folly and the pccf-wl, K Subramaniam said the state government would soon file a fresh affidavit before the hc. This needs to be filed without further delay. The people have already lost out on 10 years because of the legal tangle.
" We will never be relocated, and have no right over the forest produce. Villagers within the sanctuary can at least hope that someday they will be relocated and will get land," says a resident of Chourakund, one of the 39 villages within the mua. He continues: "Before Project Tiger, our village was much better off. We could trade in timber, bamboo and tendu. Now we cannot sell any of these, while people from villages around do brisk business in tendu leaves. Some of them even sneak into our forests to collect the leaves. We have no other option but to collect the leaf illegally. We have been forced to become thieves." His bitterness is not difficult to fathom. Just about 12 km away from Chourakund, villages such as Patia, Karada and Chaupali do brisk business in tendu. These villages fall under the territorial forest, outside the mtr and the fd has set up tendu collection centres and hired a contractor to buy the leaves from the villagers. One family in these territorial forest villages makes anywhere between Rs 3,000 and Rs 5,000 per month during the tendu collecting season, while people in nearby mua villages live in penury. Moreover, the Maharashtra government has done precious little to provide alternative sources of livelihoods. It claims that it provides work under the employment guarantee scheme (egs), but villagers complain that such work comes barely for 4-5 days a month and payments (Rs 47 per day and one kg coupon for wheat) are almost always delayed. Explains Nitin Kakodkar, field director, mtr , "There aren't any personnel to supervise egs work. Our forest guards are encumbered by numerous jobs and it's practically impossible for them to monitor egs . And when monitoring is poor, corruption is almost certain. We must understand that the primary job of a forest guard is conservation." He also admits to a paucity of funds for eco-development activities. The officials also acknowledge that villagers enter the mua to collect ntfp because it's a matter of survival for them. Surely then, this activity can be legalised and the fd can help the villagers draw their sustenance in a scientific manner.